Are you considering relocating to another country? Maybe one of these cities is a good fit. 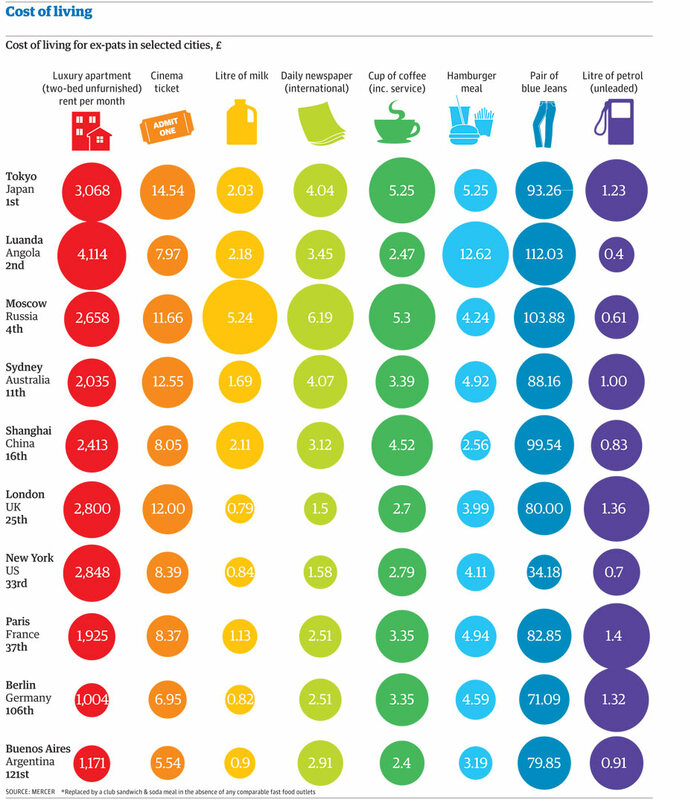 Timely that Mercer published its World Cost of Living Survey yesterday (12 June 2012) as I’ll be moving to San Francisco soon for a super cool data viz opportunity with Facebook. I thought for sure that San Francisco would be in the top 50 (we had some serious sticker shock look at houses out there!! ), but it’s not. Select data was released by the Guardian. They posted this infographic (click to enlarge), but I found it a bit difficult to circumnavigate. It’s challenging to find patterns and compare the data. For me, there’s too much information in one view. It’s good for an overview and to print, but challenging for analysis. Note that the data is a subset of countries; it does not represent the top 50. I downloaded the data and built this simple viz in Tableau. 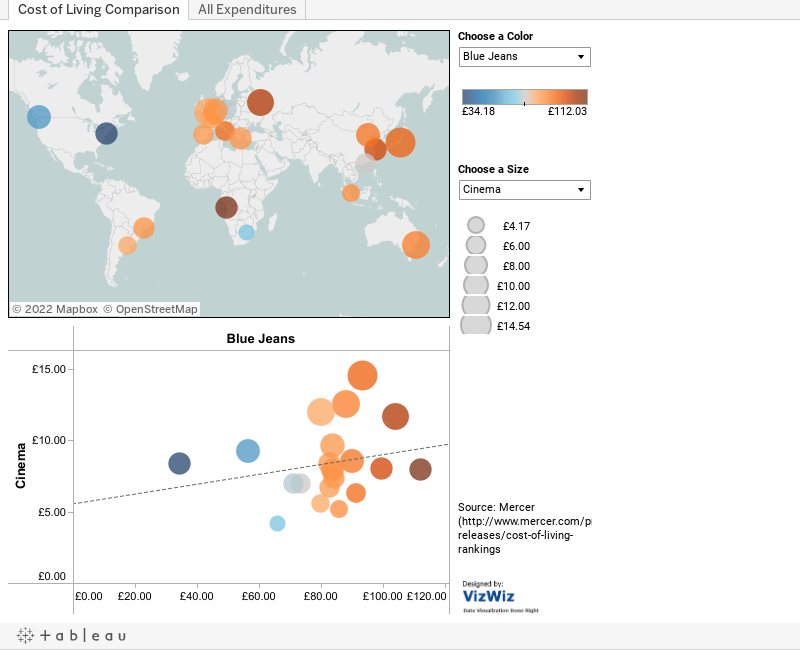 I wanted to be able to compare countries and two expenditures simultaneously, so I used Tableau’s parameters feature to allow you to choose the what you want to compare. I intentionally included both a map and scatterplot so that you have multiple methods for comparing the data. Click on a country on the map or a circle in the scatterplot to highlight the country. Hover over a circle for more information. The 2nd tab is a reproduction of the infographic the Guardian produced. It’s for reference only. I doubt you can glean much insight from it. There are some expenditures that I would have expected to correlate highly that don’t. Blue jeans vs. cinema is a good example of this. Or a cup of coffee and a newspaper. Don’t those two go hand in hand? Could you make a comparison of the total expenditure or all items between 2 cities to see where on the trend line sits specific expenditures? Re. your question whether a "cup of coffee and a newspaper" do not got together naturally? I think the bubble diagram already gives you the answer that this combination is highly culture-specific, and in Western, Anglo-American culture they certainly do (thus the cheapest combinations of the two come from the US, GB, and Canada). In other countries, coffee seems to be a Western luxury good that is not part of the traditional culture, hence v. expensive (China, Japan). And in others, newspapers are anything but ordinary (Africa). And I am sure you couldn't have found this out from the original display, so chapeau to your visualization! Thank you Lisa! If people use the vizzes I create and are able to easily find insights, as you have, then I know I've done a good job. Thanks for reading! I am the Watercooler editor at Before It's News (beforeitsnews.com). Our site, "the Youtube of news," is a rapidly growing people-powered news platform currently serving over 3 million visitors a month. We'd love to republish your RSS feed on our site, with a link back to your website. Our visitors would enjoy your content and getting to know you. It's a great free opportunity to spread the word about your work and reach new fans.